Affenpinscher is a breed that got his name from the looks of a monkey which they possess. Originating from Germany where the word âAffeâ refers to monkey from which the dog was named. The breed is believed to have its ancestral origin from Brussels Griffon and Miniature Schnauzer. 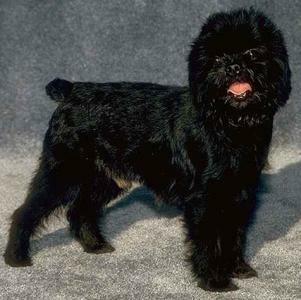 The Affenpinscher is lively, cheerful, friendly, alert, undaunting, dependent, and sharp-witted. The shoulder-height is 23 â 30cm (9.5 â 11.5in). 3 â 6kg (6.5 â 9lb). The Affenpinscher is good with children, and can also be fine with dogs of their own kind and other house hold pets. They can refuse strange visitor entry into the house. They are equally active, adventurous, curious, and stubborn, but very fun-loving and playful. This loyal little dog enjoys being with its family. They have a coarse hair which grows in whirls. The coat is mostly black, but other colors as brown and ones with grey markings are also acceptable. The coat is thicker over the head and shoulders forming a mane, with shorter coat over the back and hindquarters. Clipping the hair of this breed is not recommended but careful plucking of same does a good job to maintain the integrity of the coat as clipping tends to ruin it for many years. The Hairs that grows around the eyes should be dealt with promptly to reduce irritation to the eyes. Grooming with comb will help remove dead hair and maintain the natural curls. During training it is important to be consistent but make sure there is ample variety in the drills not to bore the creature. Affenpinschers learn commands fairly quickly. Affenpinschers have a distinct appearance that may be associated with the terriers. The most acceptable color of this breed is black butg AKC also allows grey, silver, red, black and tan.